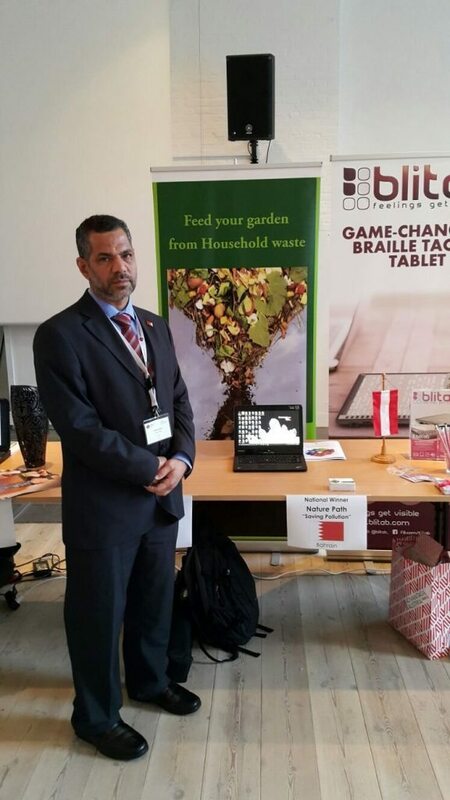 Bahraini entrepreneur Ebrahim Hameed, owner of Nature Path, one of Tenmou’s portfolio companies, recently received an honorary award along with two other GCC national winners at the Creative Business Cup (CBC) 2015 which was held in Denmark, Copenhagen. Creative Business Cup is a unique global network and marketplace that allows creative entrepreneurs to scale their business concepts, connect with investors and partners and boost their international business potential. Ebrahim’s business concept, which provides a green and environmentally friendly production of compost by turning waste into an organic soil fertilizer, won the first place in the Creative Business Cup GCC Competition held in Bahrain during Global Entrepreneurship Week last month. He joined the national winners from Saudi Arabia, and United Arab Emirates to attend the competition in Denmark. The high-profile three-day event was attended by winners from 45 countries and included several workshops and the opportunity to pitch to an international audience of business angel investors. In Denmark, the GCC national winners were received by the Saudi Ambassador H.E. Dr. Hamad Khudair, and the US Ambassador. The awards ceremony was held in the Main Hall of The Royal School of Architecture in Copenhagen, Denmark.The closing ceremony was attended by the H.R.H. Crown Prince of Denmark, where the winners of the competition were announced and awarded their prizes. Established with a start-up capital of BD1 million (US$2.7 million),Tenmou invests an average of BD20,000 – BD 30,000 (US$53,000) for a stake of on average 20% – 30% in each project that meets its criteria, and will provide a three-month mentorship period, including support services, at no cost to the entrepreneurs.